Why use a short focus, fast lens for our recent comet imaging? ask a number of readers. We have recently acquired a 400mm f/3.5 lens specifically for the purpose of work on comets with the EQ3 mount. 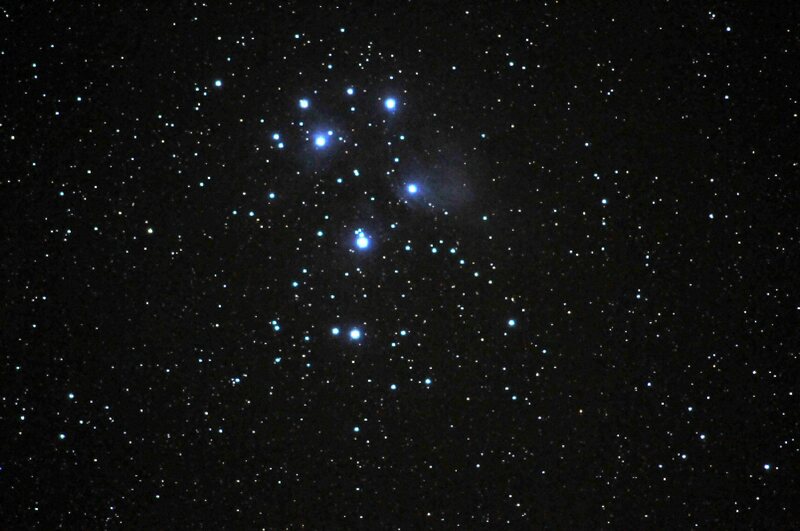 A test image for this lens on the Pleiades open cluster is attached. 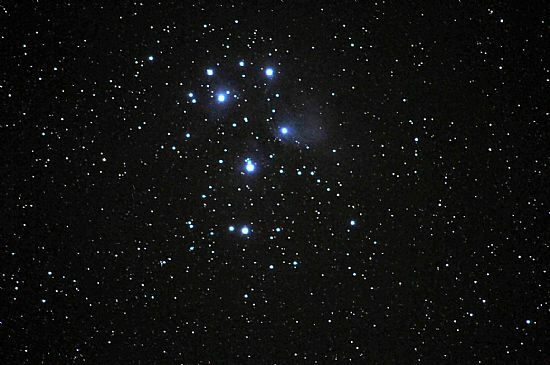 Stars to magnitude 15.5 may be achieved with exposures of 20 secs. on good, clear nights without a Moon. 2019 Jan. 02: 17h 40m UT. Nikkor 400mm f/3.5. A 20 sec. exp. D300 SLR ISO 2,500. We are in the process of putting together a feature respecting some aspects of the recent “fly-by” of Pluto by NASA's New Horizons’ space probe. In the meantime, we have received a request to state exactly how bright the Sun appears in the sky from Pluto since the images secured of Pluto’s surface by the probe will depend entirely upon lighting from the Sun itself. Pluto is approximately 40x the Earth’s distance from the Sun. As seen from Earth the Sun has a visual magnitude of –26.8. Since the intensity of light varies in relation to the square of the distance, this means the Sun appears from Pluto 1/1600th as bright as it does from Earth. This corresponds approximately to a visual magnitude difference of 8.5, giving an apparent magnitude for the Sun as seen from Pluto of –17.5. The full Moon seen from Earth has visual magnitude of around –12; therefore, the Sun appears from Pluto in the region of 250x that of our full Moon, giving ample illumination for the probe to secure images capable of transference to Earth. This mission to Pluto is an outstanding achievement providing us with invaluable information on our farthest planet (though it has by convention now been demoted to the title of “dwarf” planet!). Prior to the establishment of space probes orbiting natural Solar System, bodies (the planets mostly and the planet Earth in particular), the word satellite in astronomy was understood to refer to those natural satellites orbiting planets. Since then, artificial satellites orbiting the Earth number in their thousands and the word satellite has tended to be dropped in favour of the word moon when referring to natural satellites. Of course moon has been applied to natural satellites for donkey’s years (let’s enter a note of frivolity into the argument since media presentation of science often has an air of fantasy to it). On the other hand, in a letter to the JBAA 110 1 2000, I list a number of reputable tomes referring to these natural satellites without a single use of the word moon. Why all the fuss, you may ask? Well, for one thing, science should aim at precision and consistency. The difficulty arises out of the fact that our natural satellite, the Moon, has no real alternative word standing in for it, unless you go for lunar. Indeed there are occasions when lunar is used effectively as, for example, when we refer to the lunar cycle (less clumsy that the Moon’s cycle). Readers will notice that I have denoted our Moon by use of a capital letter (upper case) since that IS its name! Therefore, when referring to the Moon, as I have just done, should the definite article, “the”, have a capital too, thus The Moon? I dare say we could argue the hind legs off our donkey discussing this aspect of things, but where nomenclature is concerned I do feel there should be greater clarity. If one must use the word moon to signify the natural satellites of the Solar System, then lower case should be used throughout, for Moon, first letter, upper case, should only refer to our Moon.